In anticipation the festival have this week announced the first initial wave of artists and it's packed with plenty of choice. Check out the line-up as it stands below. Guto Brychan, Chief Executive of Clwb said, "Many people think of us just as a live music venue, but more recently we’ve been putting on events in other venues and locations around Wales. Providing a showcase for emerging artists and developing new ways to nurture them is core to what we do. When John suggested they wanted to handover Sŵn, it was the obvious next step for us to continue to grow and we are excited to be taking the helm and continuing its legacy." Continuing, Jon Rostron adds "When we established Sŵn we always envisaged that at some point we would hand it over to the music community and step away, and we now have the right opportunity to do this. It’s thrilling and exhilarating to step away yet know that Sŵn will continue to develop in new hands. Without doubt it will be weird to go and not have any work to do, but I’m looking forward to being free to see as many bands as humanly possible that week"
Sŵn, founded by Radio 1 DJ Huw Stephens and John Rostron in 2007, was the first multi-venue music festival in the UK outside of London, inspired by trips to SXSW in Austin, Texas and Iceland Airwaves in Reykjavik. 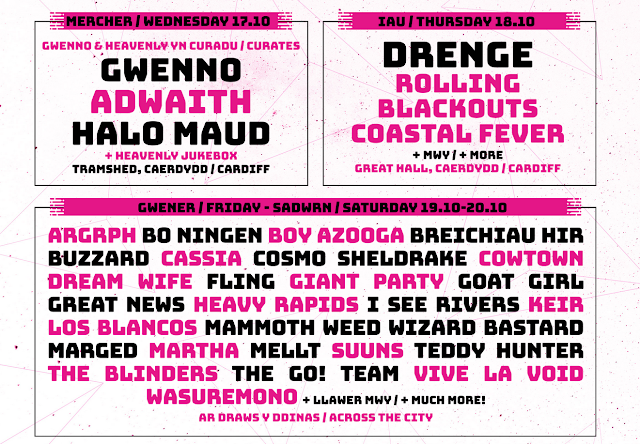 This year it falls under new management from the team behind Clwb Ifor Bach.